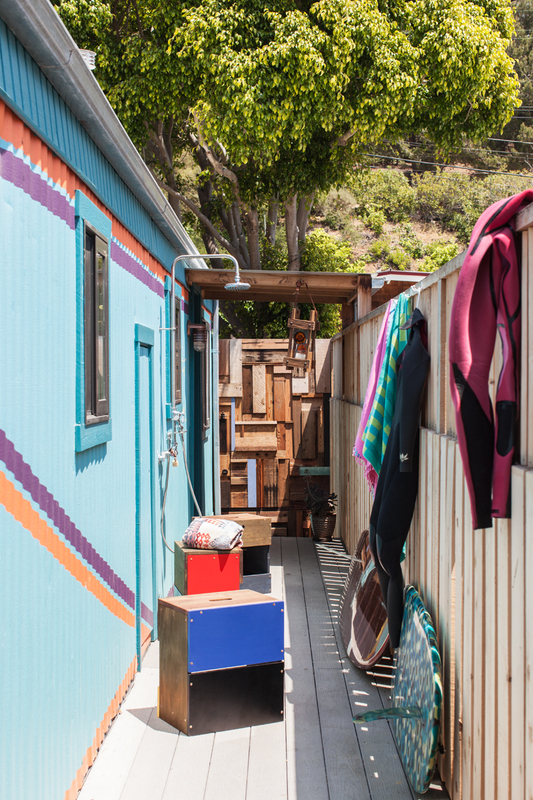 Having spent many years pining for her own space at the beach, Sofie Howard—photographer agent and owner of Los Angeles–based Commune Images—finally found it at Paradise Cove Mobile Home Park in Malibu where, adjacent to the most preternaturally local private beach in town, even single-wides have been known to go for exorbitant prices. "I've been surfing here my whole life," Howard says, "and I had always thought, 'someday, someday.'" Two years ago, she found the "dinkiest, cheapest, grossest" trailer in the park, which needed some love. "It was literally plastic and cardboard, with a camping stove and a mini fridge," says Howard, who bought the one-bedroom, 500-square-foot trailer and called in her colleague Steven Johanknecht, a principal at the design firm Commune, the L.A. design collective that houses Commune Images. "'Doctor Steven' came in and worked his magic," says Howard. Once a classic trailer-park scheme of mint green and white, the exterior of Commune Images owner Sofie Howard’s 500-square-foot Malibu trailer was distinctively repainted. The gate is a patchwork of scrap wood pieces. Partly inspired by 1970s Vans slip-ons, Howard’s boyfriend, artist Grant Shumate, painted accent lines on the side of the trailer. The porch houses a seating area with handmade MORERA Boxes from Commune, and a new outdoor shower. The entrance is beneath the wood-framed canopy. Howard and Shumate in the living room, where Commune designer Steven Johanknecht introduced custom built-in daybeds with storage beneath. The carpet-fragment pillows are from Commune, as is the table, designed by Joshua Tree–based sculptor Alma Allen. The poster is by Mike Mills. The main room serves as a living/dining/kitchen area, where there is just enough room for a Saarinen table surrounded by Nakashima chairs. Johanknecht added the cork floor, and the custom stained-glass design on the Dutch door is by artist Steve Halderman. The kitchen cabinetry echoes the new blue ceiling. The brick tile is from Heath Ceramics, as is the dinnerware. Behind the Viking stove is powder-coated corrugated metal (“Very trailer,” says the designer). The refrigerator is from Big Chill. On the table is a bowl by Victoria Morris. The blue ceiling continues into the bedroom, filled with art by Howard’s friends. The yellow-and-white poster is by Mike Mills, and the signed Rolling Stones drumhead was a gift. “It feels like a New York apartment at the beach,” says Shumate. The bedroom allows for a tiny niche for a built-in wood desk. The target painting is by Alia Penner. More fragment pillows adorn the bed, which is covered in a reversible bedspread by artist Jane Kifer. To the left of the window is a painting by Shumate. That magic included adding new furnishings (most from Commune artisans), a kitchen redo that introduced Heath Ceramics tile and new appliances, built-in daybeds in the living room that double as overnight beds for when Howard’s two children visit, and custom, ocean-blue paint on the ceiling ("with the recessed lighting and white paint, it looked too much like an apartment," says Johanknecht). "We wanted it to still look like a trailer—we didn’t want to pretend it was a house or a McMansion," says Howard. "It reminds me of northern California meets southern California," adds Johanknecht. "It’s like the anti-Hamptons." Howard spends so much summer and weekend time at the trailer, she's looking to sell and upgrade to a larger model in the park to better accommodate her family and friends. But as she revels in the space, constantly trading out one of her photographers' shots for another on the walls, one gets the idea it’s also the process she finds rewarding. "It would be fun to do again," she says.